Helloooo- I'm "Cooper" (the pooper) that's what they call me anyway. My name is Cori Jenft-Alden and my family and I are the "Alden Doggie Rescue" group. 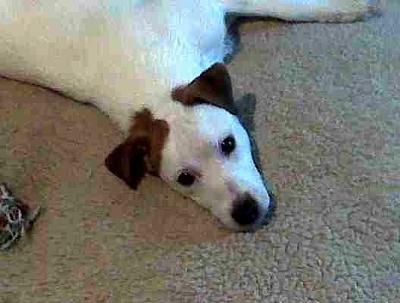 9 months ago we rescued "Cooper" a Jack Russell in desperate need of medical care. We raised nearly $1100 for Cooper's surgery, he has degenerative bone disease in his hips and was only able to walk on two legs when we rescued him. Now just about to turn a year old and on the mend using 4 legs to chase the cats around the farm, we are finding it a bit more difficult to place this guy in a permanent and loving home. Cooper loves big dogs as he fancies himself a big dog too. Cooper smiles that cheesy toothy smile when he greets you at the end of the day. We normally teach our rescue pups some of the basics when it comes to house rules and behavior, and as much as we hate to admit it..................we let Cooper skip a few of those classes because of his special needs. Cooper tries to sit on command but he is still a little stiff back there. The doc says he will someday need the other hip worked on, but it is holding on it's own for now. We don't usually keep foster pups this long, but Cooper was a special case. We would really appreciate any help you could offer in spreading the word of Cooper's search for a LOVING & PATIENT home. Cooper loves kittens, but is too aggressive for the older cat's taste. Cooper thinks he is the leader even when he does most of the following. Cooper does love to run and jump as all Jacks do, so a secure environment is important. Cold weather can make him a bit stiff and sore, so we recommend indoor time on those cold rainy days. Cooper is kennel trained, although he does give a few good whines for the first few minutes, but as long as he has his Kong and a comfy blanket or pillow he is good to go. Cooper is full of FUN, ENERGY, DIRT & LOVE all he needs is a home and a kind heart to call home. Cori Jenft-Alden "Alden Doggie Rescue"